Christ Church Greenwich is very pleased to have strong, experienced leadership in place across all parts of the organization, from the highly respected and dedicated Clergy team (led by Rector Marek Zabriskie), and our professional lay staff, to our talented and dedicated groups of lay leaders and volunteers (including our Wardens, Officers, and Vestry as well as the heads and members of our numerous Commissions, Committees, and Programs). Our volunteer activities are guided overall by the lay leaders of seven major Commissions. These Commissions are designed to help focus, mobilize, and support the work of an exceptionally talented group of parishioners, who serve the church across a wide range of important needs as described below. We also have a number of active programs and hands-on opportunities led by volunteers, including the Great Fall Festival, Outreach opportunities, the Diocese of Mount Kilimanjaro, Pastoral Care opportunities. We also have several active volunteer task forces, and through volunteer leaders maintain relationships with a number of affiliated organizations, including the Diocesan Convention, Horseneck Foundation, Sholom Center, and Neighbor to Neighbor. 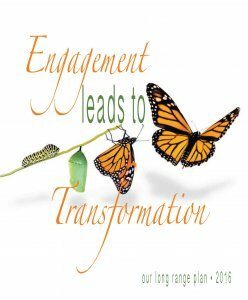 In 2016, we developed a Long Range Plan for our future with a foundational understanding that engagement leads to transformation. We are committed to offering a broad range of opportunities for engagement in the life of our parish in worship, in learning, and in service.